Normal pressure hydrocephalus (NPH) was first described in 1965 as a syndrome of gait apraxia, dementia, and incontinence associated with normal cerebrospinal fluid (CSF) pressures and dilated ventricles. Nowadays, the diagnosis and treatment are based on these criteria, although literature has shown variability of presentation and an imperfect responsiveness to lumboperitoneal shunt placement. Moreover, the classical hypothesis of CSF hydrodynamics has failed to support the generally accepted pathophysiology of NPH. Therefore, the pathogenesis of the so-called NPH syndrome should be fully revised. Many hypotheses have been advanced to explain the NPH pathogenesis. A unifying theory could be proposed according to the literature [Figure 1]. Loss of elasticity of the neuropil, extracellular matrix, and parenchyma naturally occurs in the aging brain. 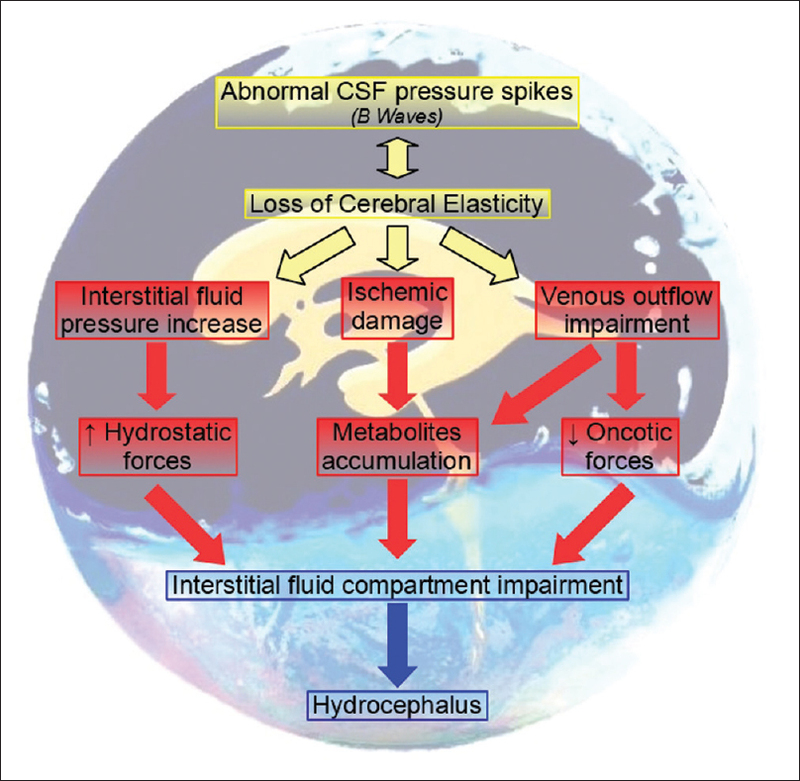 Therefore, the cerebral mantle progressively becomes more susceptible to abnormal CSF pressure spikes and this leads to both ischemic damage and an increase in the interstitial fluid pressure. The Starling resistor model, which simulates peripheral vascular resistance, consists of an elastic fluid-filled, collapsible-tube mounted inside a chamber filled with air. The static pressure inside the chamber resists the collapse of the tube by the pressure of the external air. Based on this Starling resistor model, this increase in the interstitial fluid pressure leads to a venous outflow impairment, and consequently, an inadequate vasoactive metabolites clearance. The imbalance between the hydrostatic and oncotic forces leads to an interstitial fluid compartment impairment with progressive CSF increase. In this model, the ventricular enlargement follows the interstitial fluid increase and should be considered as only a late phenomenon of the disease. As a matter of fact, there is a low rate of improvement of the clinical symptomatology in patients with NPH following their surgery. Moreover, whatever symptomatic benefits they accrue following the shunt procedure decrease within 3 years. Therefore, additional steps need to be undertaken to establish alternative neurological diagnoses in these shunted NPH patients in the long-term follow-up assessment. We speculate that NPH is the final stage of a cerebral interstitial fluid impairment (CIFI) syndrome. Accordingly, intracranial pressure monitoring and cerebral compliance assessment should be done in the early stages of illness, even in subjects without radiological findings of ventricular enlargement, especially when they initially start showing slight gait disturbance and/or cognitive disorders and early signs of cerebrovascular impairment. The cerebral interstitial fluid impairment (CIFI) syndrome requires a new diagnostic–therapeutic and follow-up approach. The venous outflow should be routinely investigated and treated early. In selected cases, ischemic injuries on MRI could reveal a CIFI syndrome and patients should be subjected to an infusion test. Careful follow-up is needed in patients with asymptomatic ventriculomegaly with features of idiopathic NPH on magnetic resonance imaging and also in patients with slight disturbances in gait, memory and bladder functions but without neuro-radiological abnormalities. Future research should introduce new tools for a noninvasive detection of the cerebral compliance. Moreover, novel therapeutic as well as pharmacological approaches are required to obviate the occurrence of irreversible disorders. Mathew R, Pavithran S. Cognition in advanced normal pressure hydrocephalus: A pilot study from South India. Neurol India 2017;65:729-31. Orešković D, Klarica M. Development of hydrocephalus and classical hypothesis of cerebrospinal fluid hydrodynamics: Facts and illusions. Prog Neurobiol 2011;94:238-58. Czosnyka M, Czosnyka ZH, Whitfield PC, Donovan T, Pickard JD. Age dependence of cerebrospinal pressure-volume compensation in patients with hydrocephalus. J Neurosurg 2001;94:482-6. Silverberg GD. Normal pressure hydrocephalus (NPH): Ischaemia, CSF stagnation or both. Brain 2004;127:947-8. Oresković D, Klarica M. The formation of cerebrospinal fluid: Nearly a hundred years of interpretations and misinterpretations. Brain Res Rev 2010;64:241-62. Espay AJ, Da Prat GA, Dwivedi AK, Rodriguez-Porcel F, Vaughan JE, Rosso M, et al. Deconstructing normal pressure hydrocephalus: Ventriculomegaly as early sign of neurodegeneration. Ann Neurol 2017;82:503-13. Cardim D, Schmidt B, Robba C, Donnelly J, Puppo C, Czosnyka M, et al. Transcranial doppler monitoring of intracranial pressure plateau waves. Neurocrit Care 2017;26:330-8.